Andrea L. Axtell, Philicia Moonsamy, Jacob P. Dal-Bianco, Jonathan J. Passeri, Thoralf M. Sundt, III, Serguei Melnitchouk. Objective: To review the efficacy of a minimally invasive surgical technique for mitral valve (MV) repair, we reviewed our institutional experience using a non-resectional technique for degenerative mitral regurgitation (DMR). Methods: A retrospective analysis was performed on 101 consecutive patients who underwent a minimally invasive MV repair for severe DMR between 2014-2017. All patients underwent a right lateral mini-thoracotomy and femoral cannulation and were repaired via a non-resectional technique using neochord implantation and ring annuloplasty. Patients were followed with longitudinal echocardiograms. Results: The median age was 58years [IQR: 49-64] and 31% were female. The procedure was successfully performed in all patients except for one who required an extended thoracotomy. A median of 4 neochords/MV were placed (range 2-8); 90% were secured to the posterior leaflet, 5% to the anterior leaflet, and 2% to both (3% undocumented.) The median length was 16mm [14-18] and ring size was 34mm [32-36]. Concomitant procedures included left atrial appendage exclusion in 10(10%) and patent foramen ovale closure in 13(13%). Median cardiopulmonary bypass time was 152minutes [142-164] and aortic cross-clamp time was 90minutes [81-98]. Operative mortality was 0% and 1-year survival was 100%. At 3 years, freedom from recurrent at least moderate mitral regurgitation was 100% and no patient required a valve-related reoperation. At one year, the median left atrial diameter decreased by 15% (44 vs 37mm, p<0.001), the left ventricular end diastolic diameter decreased by 14% (53 vs 46mm, p<0.001), and MV gradients remained low (3.1 vs 2.9mmHg, p=0.54). 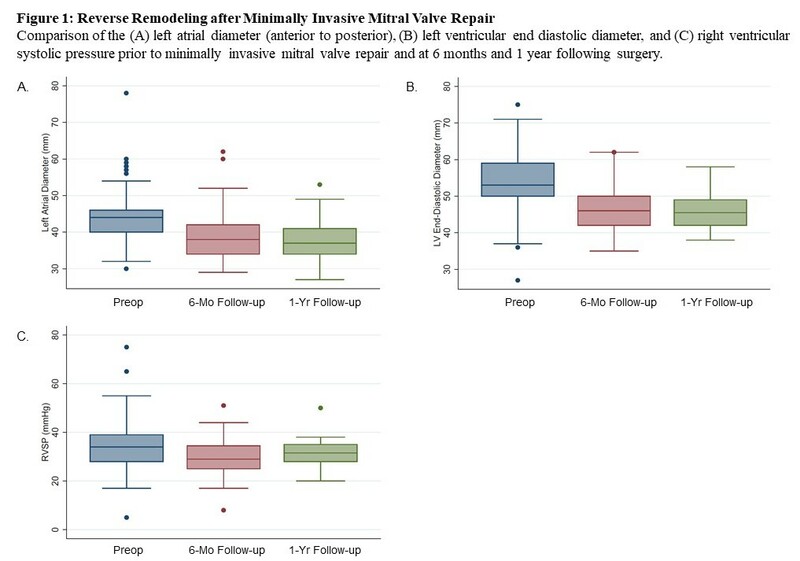 Conclusion: Minimally invasive MV repair via a non-resectional technique can be performed in patients with severe DMR with a low complication rate, excellent durability, and promising left ventricular reverse remodeling.